ASRM awards Professor Carlos Simon, Scientific Director IVI Igenomix, in recognition of his career in research. Professor Simon is a renowned national and international figure, with numerous awards including the prestigious “Premio Jaime I de Investigación Clinica” (Jaime I Prize for Clinical Investigation) in 2011. The research career of Professor Carlos Simón, Scientific Director of IVI and Igenomix, has been recognized during the opening ceremony of the 72nd Annual Meeting of the American Society for Reproductive Medicine (ASRM), held in Salt Lake City (Utah, USA), where he was presented with the ASRM Distinguished Researcher Award, an honorary award which has to date only been given to 11 researchers in this field, now Professor Simon is the first European to join this select group. His pioneering contributions, both basic and clinical, in reproductive medicine together with his essential contributions in the field, have not only helped the development of this area of medicine but also specialists around the world to improve their results and thereby help every couple that cannot conceive and dream to have their own healthy baby. All this has been the determining factor as to why Professor Simón was proposed for this award. Professor Simon, whose scientific career has been based on investigating clinically relevant unresolved issues and looking to new technology for solutions, is today one of the most knowledgeable experts on the human endometrium. He has more than twenty awards endorsing his scientific career and half of these have been international. 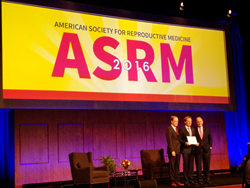 "It's a real honor for me, as a clinician and research scientist, to be recognized by ASRM, one of the most important societies in the world of reproductive medicine. I am extremely proud to be a part of that small list of pioneers, " said Professor Simon after collecting his award from the ASRM President, " this award is also for my team, who started with me in IVI and followed me to Igenomix” he added. The ASRM Distinguished Researcher Award, recognizes the work of those members of the society who have excelled in their outstanding contributions to clinical or basic research in reproduction over the past 10 years. ASRM dedicates this award to researchers who demonstrate a continuing commitment and long-term advances in research in the field of reproductive sciences as well as in the education of future scholars in this area. Born in Spain (Valencia, 1961) Professor Carlos Simon is a specialist and Professor of Obstetrics and Gynaecology at the University of Valencia, Scientific Director of IVI and Igenomix, a Professor at Stanford University and the Baylor College of Medicine, USA. Since 1991 he has contributed with his pioneering work and research to providing clinical solutions to problems that cause infertility. Using microarray technology, Professor Simon found the transcriptomic signature of identified genes present in human endometrial receptivity and published his findings in 20 papers, the first of which was the most cited in the Journal of Molecular Human Reproduction. The clinical realisation of his results led to the creation of a patent to create a customized array called Endometrial Receptivity Array (ERA) designed to ascertain the molecular diagnosis of endometrial receptivity in infertile patients (Fertil Steril. 2011) and these days ASRM recognizes its proven success, which has delivered pregnancy rates of 85%. Professor Simon also created a database on endometrial receptivity that is freely available and managed by Valencia University. The scientific impact of his work is reflected in the production of 384 articles published in international journals that total a cumulative impact factor of 1667.545. His work has received a total of 12,754 citations with an average of 34 citations per article. He has an h index of 65 and is has published 18 books in English, Spanish and Portuguese and 20 monographic notebooks, making him one of the most prolific Spanish scientists in the world. As an inventor, his research has resulted in 16 patents, 15 international and 1 national for biotech products that are produced and distributed by Igenomix, the Spanish biotechnology company currently headed by Professor Simon. IGENOMIX is a biotechnology company that provides advanced services in genetic reproduction. It has a wealth of experience and advanced research capabilities that has made this company one of the world leaders in its field, enabling it to provide effective solutions tailored to different infertility problems. The company has a presence in Valencia, Miami, Los Angeles, New York, Mexico D.F, Sao Paulo, Dubai and Delhi with a team of more than 165 qualified professionals worldwide. IVI was born in 1990 as the first medical institution in Spain to specialize entirely in human reproduction. Today, it has more than 50 clinics in 11 countries and is a leader in reproductive medicine.